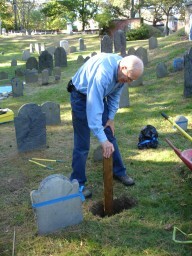 The Friends of the Old Burying Ground have hired Minxie and Jim Fannin of Fannin-Lehner Preservation Consultants, Concord, MA. 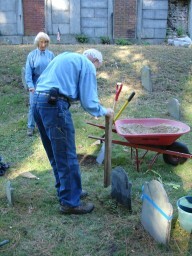 to repair and preserve the cemetery. 1. The stone is removed and cleaned using water and a non-ionic detergent (Kodak Photo Flo). A mixture of peastone gravel and sand is used as the new foundation. 2. The sand and gravel is tamped down. 3. The stone is replaced and more sand and gravel is added. 4. The additional sand and gravel is tamped down. 5. The stone is measured and adjusted for straightness. 6. More sand and gravel is added. 7. The original sod is replaced. We emphasize the preservation and conservation of the original object rather than its restoration. The term restoration can mean trying to make the object look new once again. An extreme example would be re-carving a weathered stone. 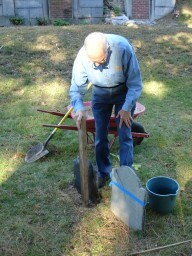 Our goal is simply to extend the life of these artistic and historic gravestones. 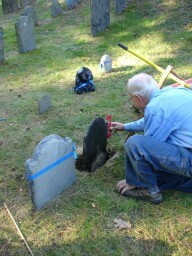 As stone conservators we are familiar with the materials and techniques used with gravestones and monuments from the seventeenth, eighteenth and nineteenth centuries. Cemeteries are more than an area composed of a collection of separate elements; they are a cohesive landscape whose overall character is defined by the relationship of features within it. Although we are focusing on gravestones and monuments, it is important to recognize that there are other features such as signs, wrought iron fences, granite curbs, entrance posts, stone walls, paths, trees and other vegetation. Understanding, conserving and enhancing the landscape as well as the gravestones and monunements is crucial to the goal of retaining the special character of a cemetery. We carry out a wide range of conservation procedures. There is the straightforward procedure of cleaning and resetting a sizeable number of stones. 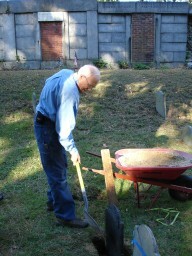 Incidentally, we only clean what we work on, never just clean to "spruce up" a cemetery. We perform adhesive repairs on a number of broken slate gravestones and footstones. In some instances stones are splitting vertically or what we call delaminating. This is where we "tack" and "cap." Broken stones with missing bottom sections present another challenge. 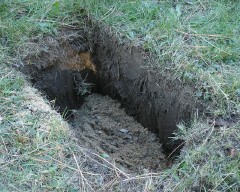 As these stones are too short to reset, special concrete bases with a slot for the stone are cast and put into the ground. 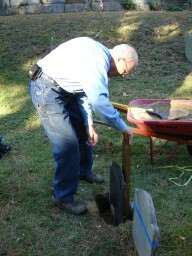 The stone is then mortared into the slot with a soft mortar and the base covered with sod. If we have done our job well, you will not know what stones are standing with the help of these concrete bases!